Guaranteed Departure for minimum 10 passengers. This tour package is designed as a small group but still has a minimum group size requirement. Chinatour.com will refund the full payment to customers if they can not change to the other available dates when the group size does not reach the minimum requirement. Xin Chao! 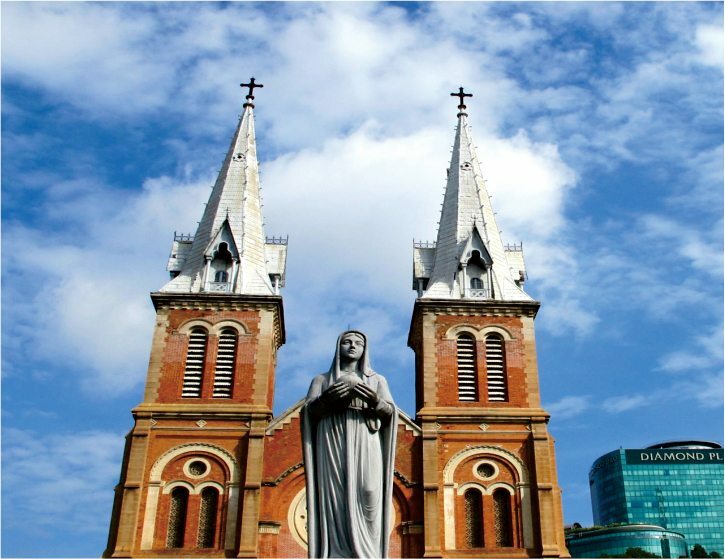 Welcome to Ho Chi Minh City, also known as Saigon – the most dynamic city of Vietnam where modern high-rise buildings sit next to ancient temples. Enjoy your morning on your own or join the optional half day tour to Cu Chi Tunnels. Our tour starts in the afternoon with a visit to Notre Dame Cathedral. Next to the cathedral stands the Saigon Post Office. Then, visit the People’s Committee Hall. Continue on to see The Municipal Theater of Ho Chi Minh. The last visit of the day is to Ben Thanh Market. In the morning, travel from Saigon to the Mekong Delta. 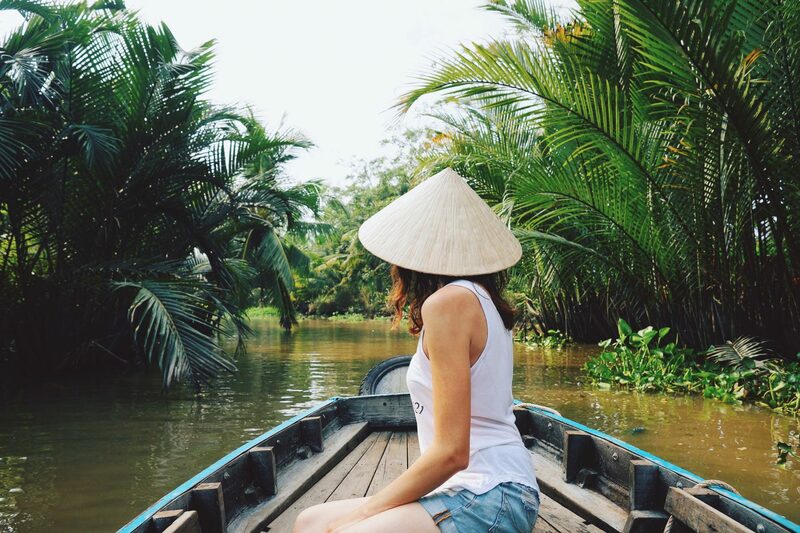 Upon arrival in Ben Tre, take a boat down the river. Stop at brickwork to see how to make bricks in according to traditional methods: soil brick is molded from clay, arranged inside a kiln and processing workshops located along the canal. Go on natural scissors creeks where they look narrower to the village. In the morning, you will board a boat to visit Cai Rang floating market. Take in the daily activities of the locals who live along the Mekong canals. 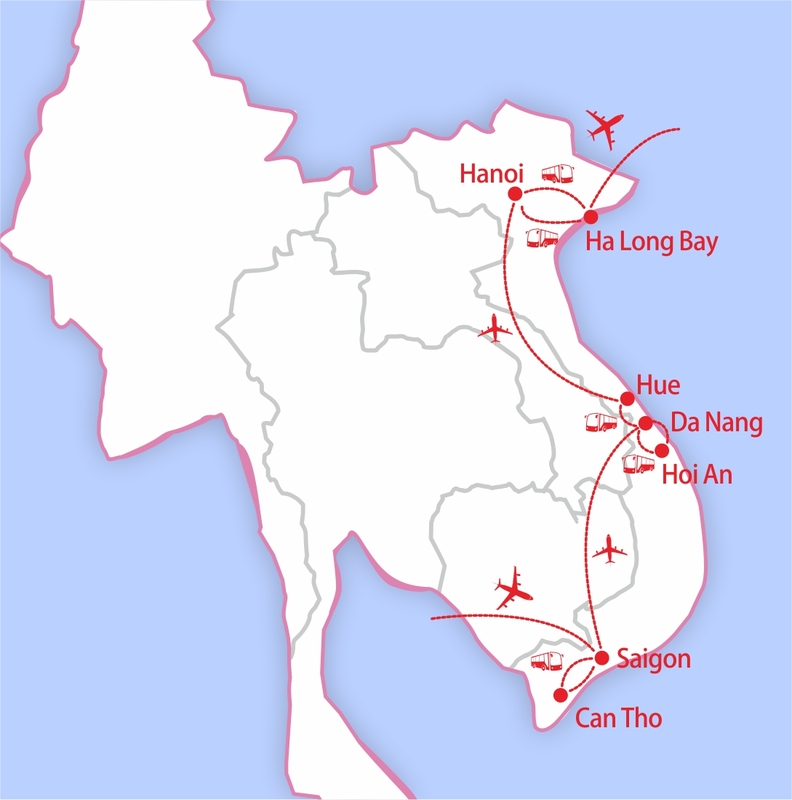 Then meet your driver for the trip back to Saigon and to the airport for the flight to Danang. 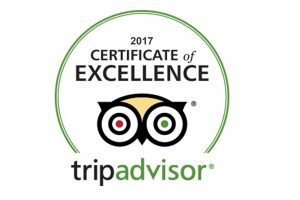 Upon arrival, meet with your guide and transfer to the hotel in Hoi An. In the morning, visit the ancient streets of Hoi An, lined with Chinese traders’ homes and wooden houses reincarnated as restaurants, cafes, and outlets for local artists, craftsmen, and tailors. Explore the beautiful 16th century Japanese Bridge. Hoi An’s unique fusion of Chinese, Japanese, and Vietnamese architecture is beautifully displayed here, in what is arguably Vietnam’s most tourist-friendly town. Free at your leisure, or join our optional tour: Farming & Fishing Life. Leaving Hoi An in the morning, you will head out to Hue, the Vietnam’s last feudal capital. Here you can stop to admire the stunning views: north over Lang Co Beach and south over Da Nang City. 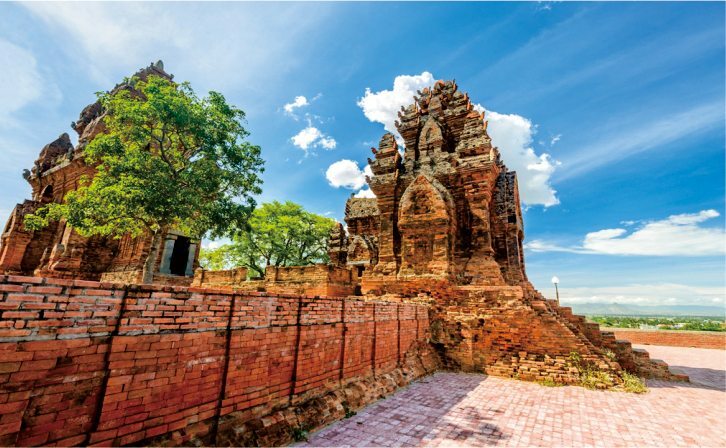 Once in Da Nang, you will stop by the Cham Museum, housing the most completed collection of Cham artifacts anywhere in the world. Upon arrival in Hue, keep driving to Tu Duc Tomb. In the morning, take a trip to Hue Imperial Citadel. The imperial city of Hue is the best-preserved remnant of a vast citadel and royal quarters that once existed on the site. You will be transferred to airport to board your domestic flight from Hue to Hanoi. Breakfast at the hotel before heading out to Ha Long Bay, a UNESCO World Heritage Site. 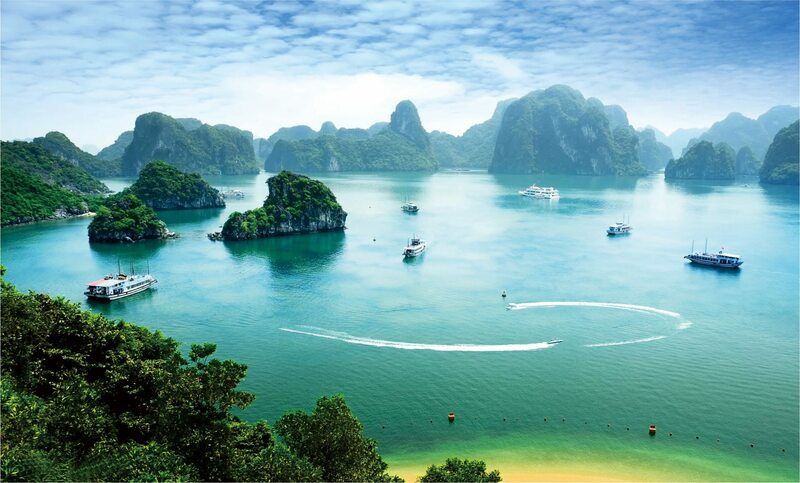 In Ha Long, you will board an overnight cruise among the more than 3,000 limestone islands rising majestically out of the turquoise bay. You will pass grand rock formations and quaint fishing towns and sample a delicious lunch of freshly caught fish and seafood. Start the day with calming Tai Chi, often accompanied by an amazing sunrise and the quiet, breath-taking beauty of the bay’s landscape. 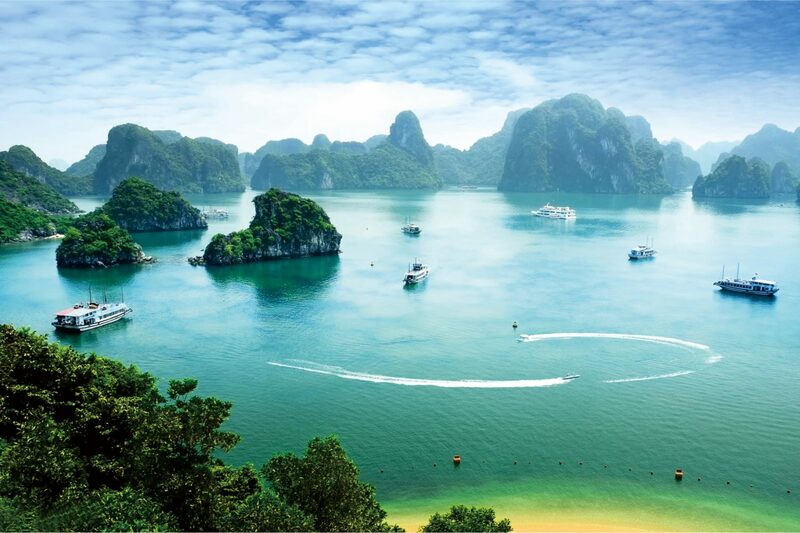 The cruise passes beautiful spots such as Trong, Trinh Nu, and the Me Cung Caves, and you will have a chance to explore Surprise Cave before having buffet brunch on board. Back at the dock, head out to Ba Dinh Square and start our day with The Presidential Palace (formerly Palace of the Governor-General of French Indochina), Ho Chi Minh’s house-on-stilt and nearby One Pillar Pagoda. Following is a visit to the Temple of Literature and Museum of Ethnology. 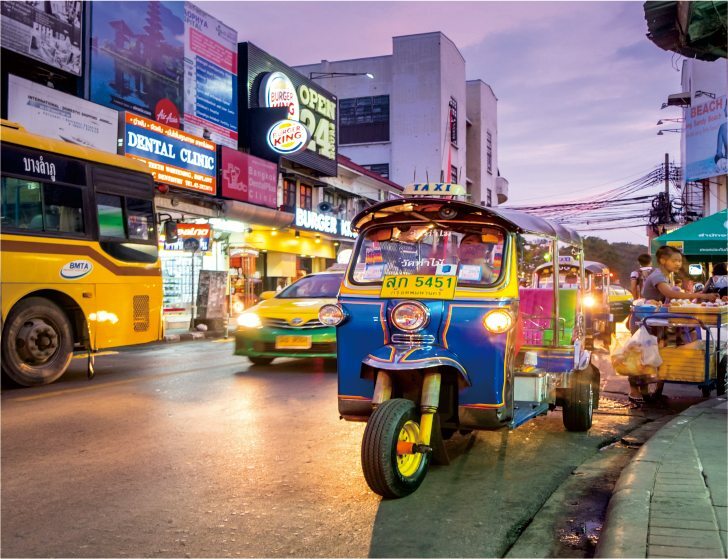 Drive to Hanoi Center and explore the city’s lively Old Quarter. Later, say goodbye to Vietnam as you will board your flight home.